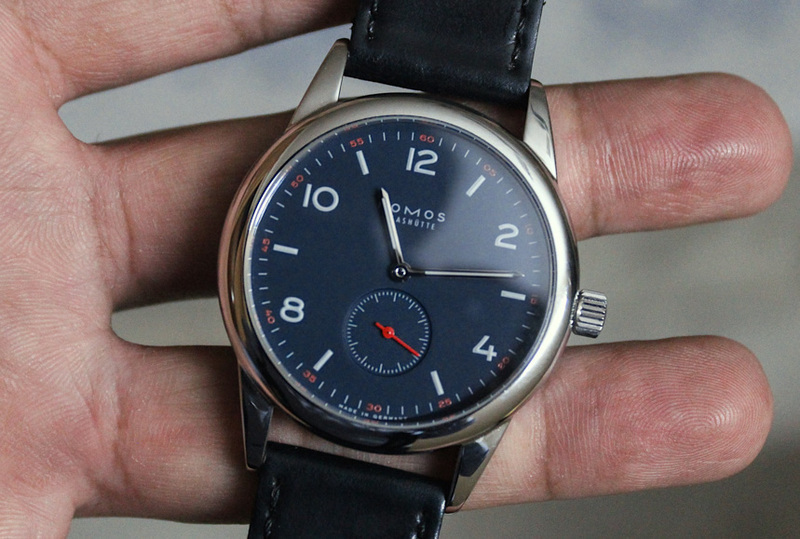 Nomos is known for making some really nice Bauhaus-inspired timepieces that are not only finished to a high standard but offer a great value proposition in the entry-level luxury watch market. 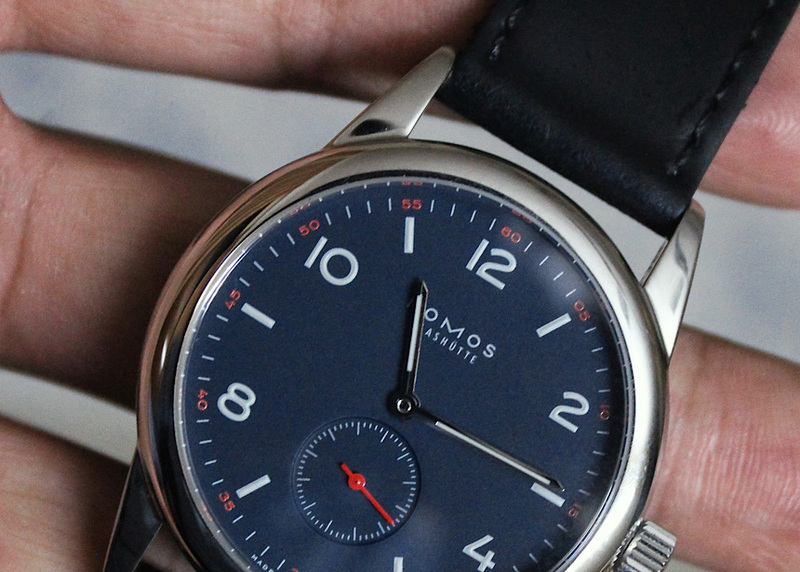 Being an admirer of well-executed simplistic designs, I have always watched out for any new offerings from Nomos, but didn’t have the opportunity to handle one in person until last month when I finally got to review a special limited edition watch from the brand for the retailer Timeless Luxury Watches. The Nomos Timeless Club II distinguishes itself from the original model by having a blue dial with red accents, which I really grew to like. If you take a look at the Nomos watch catalog as it is today, you would see that a substantial part of their collection is made up of elegant looking, traditional timepieces. Although those watches definitely stand on their own in terms of what they offer, they do tend to get a little repetitive at times, and that is where the brand’s Club collection comes into the picture, making things a tad more playful and sporty. Having said that, what I really love in most of the Club watches is how versatile they are. 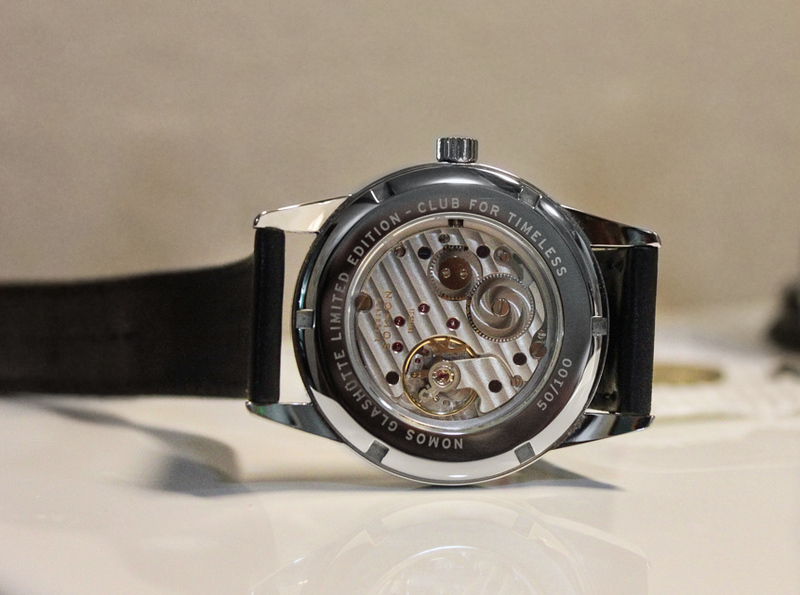 The Nomos Timeless Club II, as the name suggests, is a result of a collaboration between the folks at Timeless luxury Watches and Nomos, and is the successor to the Nomos Timeless Club released in 2015. The edition II shares quite a few details with its predecessor except for a few key differences. This version shares the 38.5mm case and the blue and red colorway but Timeless have done a great job of improving the previous version by making the dial look cleaner, omitting the date functionality, and at the same time, introducing a new and interesting blue and yellow colorway. Whenever I look at a new watch, my love affair with the timepiece is dependent upon how attractive I find the dial of the watch, and I was happy to find this dial to be well executed and appealing. 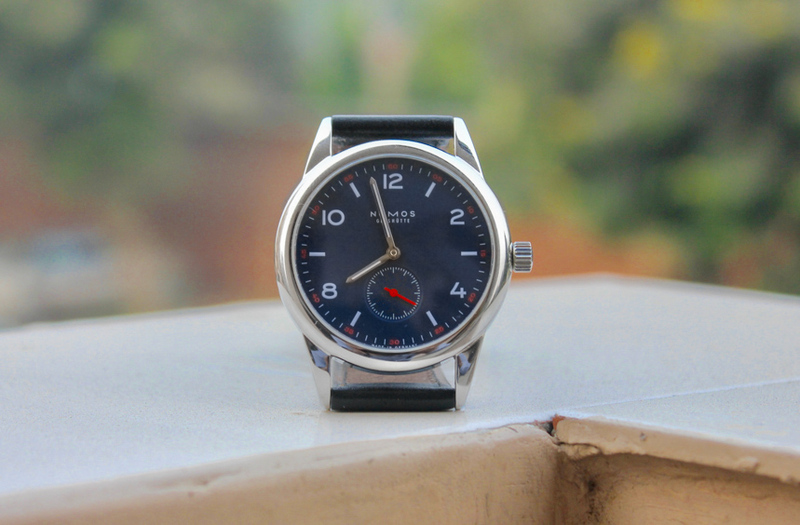 The base dial color of this watch is a nice and subtle shade of blue and has a matte finish to it. The color plays really well with the light and showcases different hues of blue depending on the lighting conditions the dial is exposed to. The pop of color on this watch comes in the form of the bright red minute markings along with the red subsidiary seconds hand, which really makes this watch feel lively and sporty. And, just in case red is not your taste in color, you can opt for the blue and yellow combination which is the second variation of this watch. Being in the IT industry, another important aspect I look for is how well the watch would fare in an office environment. 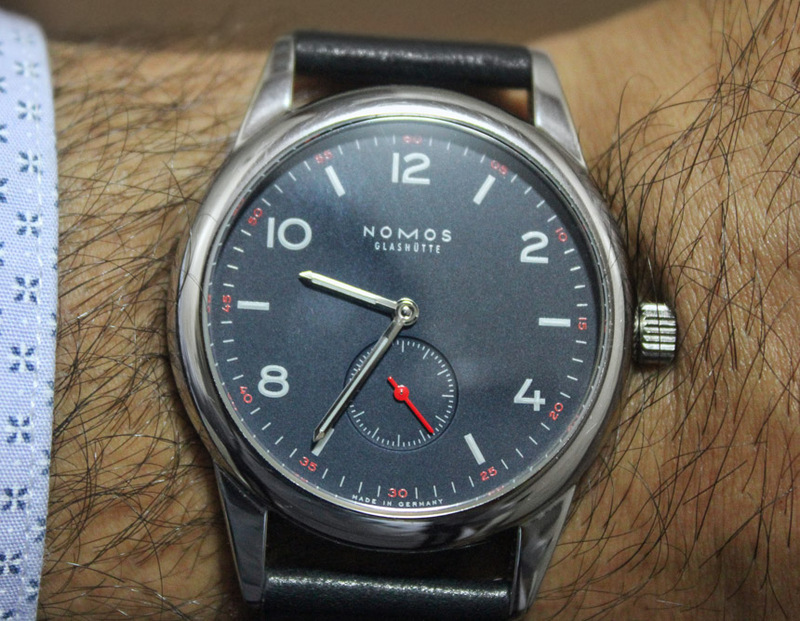 To be honest, when I first looked at the press renders of the Nomos Timeless Club II, I had my doubts about the blue and red color scheme being a little too gaudy (well, for a Nomos). But having handled the watch personally and wearing it to the office regularly for weeks, I can assure you that this watch can easily pull it off as a good dress watch, especially when paired with a nice leather strap such as the one it comes on. The hour markers on this watch are a mix of printed numerals as well as baton style markers. This is an interesting choice as it makes the dial look distinctive and also gives the watch a sporty edge. The markers along with the hour and minute hands have been painted with luminescent material, and although the glow isn’t as bright as a dive watch, it’s definitely functional and helps with reading the time in low-visibility situations. 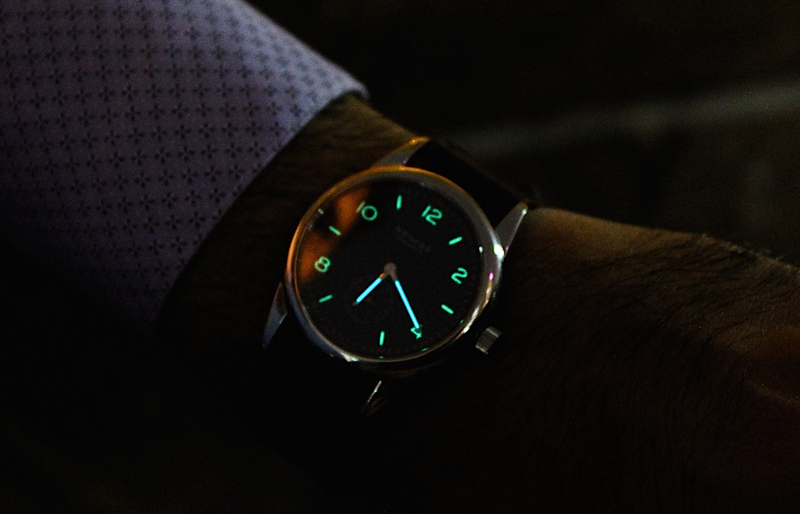 Another interesting detail is the use of a separate color of lume for the hour and minute hands as compared to the hour markers. The hour markers have a green glow to them, whereas the handset glows blue. While I am not sure of the reason behind this, as this is not exactly a dive watch, it sure does look cool. The minute markers on the Nomos Timeless Club II are these thin printed white lines with printed red numerals at the 5-minute intervals. Finally, you have the bright red seconds hand, which is shade or two darker than the red minute markers and is centered on the sub-dial at 6 o’clock. The sub-dial has also been recessed, adding some depth and visual dynamic to the dial. It also has a printed chapter ring to read the elapsed seconds precisely.